In the morning hours of Saturday 11 August, Nagy Shaker was in bed, fatigued by illness but in a good mood. He then asked for his laptop so he could do some online research for one of his students. A few minutes later Vera thought her husband had fallen asleep but the truth was that he had slipped into a coma, a state which only deteriorated over the following days leading to his passing a week later, on 18 August. Egypt’s renowned puppeteer is widely known for his role as a chief designer and puppet maker on one the 1960s’ greatest works Al-Leila Al-Kebira (The Grand Night), a puppet operetta with poetry by Salah Jahin, music by Sayed Mekawy, scenography by Mostafa Kamel and mise-en-scene by Salah El Sakka. Nagy Shaker was in fact a jack-of-all-arts (and master of them all) as well as an incredible human being. Both Lagator, who hails from the former Yugoslavia, and Shaker’s lifelong friend Omneya Yehia, once his student at the Faculty of Fine Arts, Cairo, and now a professor at the same institution, testify to a humanity beyond even the highest expectations. But the range and penetration of his work is just as impressive. Shaker’s seven-decades of artistic practice were not limited to the art of puppetry and it would be unfair to confine his creativity, dynamism and passions to one genre. Al-Leila Al-Kebira’s creator and the father of Rihana from Shehab Al-Din’s Donkey (1962) explored numerous creative genres apart from puppetry, often interweaving two or more of them in unexpected ways. He was, among other things, painter, stage and film director, costume, set and lighting designer and all-round scenograph. In these tasks, he explored light, shadow and movement, words and silence, objects and symbols. To Shaker, art was a medium through which to translate and materialise his bountiful thoughts and ideas, experiences and observations, reveries and daydreams. Shaker came to this world on 16 February 1932 and he was fascinated by art since childhood. As Lagator divulges, he was fortunate to have support from his family for his first drawings and paintings. “While many parents prefer their children to have ‘proper jobs,’ become doctors or engineers, Nagy’s family encouraged his artistic enthusiasm,” she explains. Such a fertile background allowed Shaker to spread his wings. 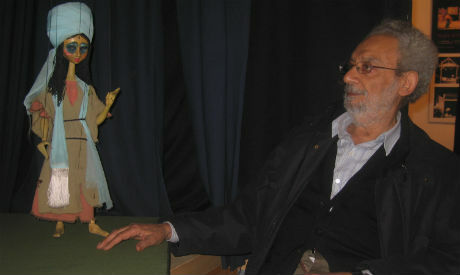 Having entered the Faculty of Fine Arts’ décor department, Shaker became the first student in the school’s history to dedicate himself to puppetry, and the first to present a puppeteering graduation project, Oqlet Al-Sobaa (1957). At the time his knowledge of the field was fed in large part by contact with international practitioners, and an ongoing search for magazines and books. It did not take him long to realise the importance of puppetry outside his homeland, and how its rich meanders were far more complex than the popular aragoz marionette known in Egypt’s grassroots culture. Shaker’s talent, passion and determination had the power to open many doors. His first years after graduating produced the epic-making operetta, Al-Leila Al-Kebira. Shaker’s inspiration for it came from short radio programmes on the moulid (a folk carnival celebrating the Prophet or a saint’s anniversary). Turning the celebratory mood into a full-length play with a developed plot and distinctive characters was definitely a challenge, yet the towering trio, Shaker, Jahin and Mekawy, were determined. In 1960, the play finally saw the light to unprecedented success. The story and the marionettes touched the hearts of children and grown-ups alike, and filled local and international art critics with awe. For the play, Shaker created numerous unique and lovable characters: children, clowns, a lion tamer, the omda (mayor), and street vendors such as Nishan, a puppet modelled on Salah Jahin. Not many of us know that when Mekawy, a blind musician, found out Nishan was modelled on the poet, he placed a coin for good luck inside its head where it remains to date. And indeed, the play turned to be a resounding hit. The international accolades began with Bucharest’s international puppet festival (1960), where it won awards for puppet and scenography designs. Such achievements were repeated over the years as the play continued to collect awards and recognition in Syria (1967), the USA (1980), Jordan (1993), France (1995), Italy (1997) and Tunisia (2000) as well as Egypt. In Bucharest, Shaker learnt that the city had three puppet theatres with vibrant year-round programming. Comparing with Cairo, which didn’t have even one puppet theatre, Shaker resolved to shake up the status quo. Together with Jahin he presented a puppet theatre’s project to then Minister of Culture Tharwat Okasha, who approved it three months later. In 1960 Shaker travelled to then West Germany to continue his studies of puppetry. Upon his return (1963) he was pleasantly surprised to find a new edifice erected in Cairo’s Abdeen neighbourhood, ready to host a puppet theatre. The theatre’s opening was coupled with a celebration dedicated to Shaker’s years of creativity (March 1964). The evening included Al-Shater Hassan, a play that had premiered at the Arabic Music Institute in Cairo back in 1959, in addition to extracts from his other works including Bent Soltan (A Sultan’s Daughter, 1960) in which he collaborated with the renowned Romanian puppeteer Margareta Niculeuscu, another lifelong friend who passed away within hours of him. Shaker’s second cooperation with Jahin and Mekawy – now working with Romanian artist Florica Teodoru – was Shehab Al-Din’s Donkey (1962). It had a special place in his heart, especially one particular character, Shehab El-Din’s daughter Rihana. An epitome of poverty and kindness, this Egyptian girl – created during his stay in Germany – may well have represented the artist’s longing for home. He loved Rihana as if she were his own daughter and was often pained to see her neglected in the theatre’s storage rooms. Throughout the years that followed she returned to the stage several times and participated in numerous local and international puppet exhibitions, each time restored by Shaker. 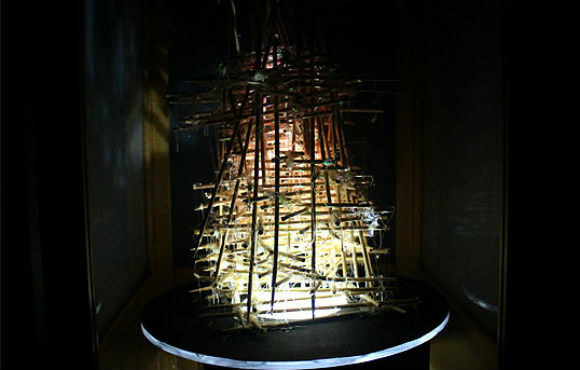 Rihana made her last significant appearance in 2016, during the artist’s retrospective exhibition organized at the Gezira Art Centre in Cairo, one year after Shaker was honoured with a state Appreciation Award in the field of arts, one of top awards granted by Egypt’s Ministry of Culture. At the Gezira Art Centre, Rihana was in a glass box, a small space that also included minor touches from the scenography so that the puppet could enjoy her original environment. She was dressed in a blue and ochre-olive outfit; her big eyes contrasted with a small fine nose and her tiny rosy lips added sweet innocence to the ebony face. Rihana knew all the secrets of Nagy Shaker, and stood by him through the years. At the Gezira Arts Centre, she greeted the visitors silently projecting her charming timidity, as if not wanting to take the spotlight away from her creator. “Nagy would often ask Rihana, ‘How come I am getting older and you never change?’ And he always treated her with tenderness,” Lagator reveals. The special bond between Rihana and Shaker was also obvious to the visitors of his 2016 retrospective. I remember Shaker’s eyes twinkling as he proudly introduced me to the “daughter” who stole his heart, probably more nimbly than all the popularity of Al-Leila Al-Kebira ever could. This idea first materialised in Madinet Al-Ahlam (or City of Dreams, 1964), a shadow theatre-based play with poetry by Abdel-Moati Hegazi and tackling many social issues. Margareta Niculeuscu wrote extensively about City of Dreams, stressing its novel approach to form, light, colour, shadow and movement, leading to a new level of poetic, philosophical and artistic symbolism. As both Lagator and Yehia reveal, thoughts and daydreams always preoccupied Shaker, and he would often drift away into his own world, from which he would emerge with ideas for the execution of new projects. In the process, he always remained fresh and had something unique to offer. “In City of Dreams Shaker explored shapes, shadow and light in an unconventional way. In fact, image and light played very important roles in all his creative work, giving vitality to his practice,” Yehia explains, pointing to one of Shaker’s last exhibitions, “Light Talk” (2015), held on faculty premises. “Light Talk” closed a circle of light explorations but that resulted from illness and death, not from lack of ideas or indeed the energy to execute them. The 1960s were probably the most inspiring years for Shaker and artists at large. With many doors opening, theatre, ballet, film academies, music conservatory and international exchanges, there was enough dynamism to nurture creative minds. In those years, Shaker cooperated with many big names such as poet Fouad Haddad in a play, Doqqi Ya Mazzika (1967) which he directed while scenography and puppets were designed by his brother Ihab Shaker. He also worked with Alfred Farag, whose Al-Zir Salem (starring Samiha Ayoub) was staged at the National Theatre (1967) with his scenography and costumes. Along parallel lines, Shaker’s international recognitions multiplied though, despite many opportunities to settle outside Egypt, he never wanted to leave. “Nagy Shaker would say, ‘Why should I leave Egypt? Where can I find this sun? I can’t live or create without sun.’ Even though he travelled a lot, cooperated with many international artists, reached many successes on world stages, he felt he primarily belonged to Egypt. His practice and thoughts were fed by international art, experimental theatre and film practices included, yet at the same time he was deeply rooted in Egypt and its culture. Isn’t this obvious in many of his works?” Yehia reminisces before picking the thread of Shaker’s experimental film titled Saif Sab’in (Summer 70, 1970-71). Summer 70, produced on a minimal budget and a 16 mm camera, was an unscripted, silent black and white experimental film, 66 minutes long, co-directed by Shaker and Italian filmmaker Paolo Isaja. The young protagonist is an American woman with Italian roots named Gloria, who visits Rome in search of her identity. The film, which was screened in 1972 at the San Marino International Experimental Film Festival and then across Europe, is now included in the famed New York Museum of Modern Art (MoMa) Mapping Subjectivity film series. The film also entered the Arsenal – Institute for Film and Video Art in Berlin and took part in the 16 mm format exhibition “A Paradise Built in Hell” in the 2014 International Summer Festival Kampnagel, Hamburg. Early 1970 also saw Shaker’s explorations of what he called “theatrical games” materialised through Al-Walad wa Al-Usfour (The Boy and The Bird, 1973) with scenography, scenario and mise-en-scene by the artist. Performed in Bucharest, the play saw children’s participation in the work that combined actors and masks. With such a portfolio, Shaker continued to create, in those years giving a lot of time to scenography and costume work for cinema. Among his significant contributions to the cinema are costume and accessories designs done for Shafika and Metwally (1978), a film directed by Aly Badrakhan, with screenplay and poetry by Jahin, and starring Soad Hosny and Ahmed Zaki among other renowned actors. No wonder the sketches for the film took up a lot of room at the Gezira Arts Centre during the 2016 retrospective, while the film screened in one corner. Meanwhile Shaker did not give up on his work in theatre and television. He designed scenography and costumes for The Wedding (1975) directed by Mohamed Morgan and staged at the Modern Theatre as well as a 1986 play, All in One, directed by Mamdouh Tantawi. A few years later, the puppets designed by Shaker were featured in Kani wa Mani (1992), an Egyptian television production. This was followed by puppet and scenography design for The Affairs of Kariagos (1993), performed in Wekalet Al-Ghoury, a project that joined puppets with humans while showcasing his interest in exploring new and unconventional theatrical spaces. The famed photo in which Shaker appeared surrounded by puppets comes from this play. Another work worth mentioning was his scenography for Ghorba: Images of Alienation (2006) presented by the Experimental Group. “Unlike many creative minds, Nagy Shaker was very organised; all his work was labelled and archived in files with reference notes and in the computer,” Yehia tells me. This fact was of great help when in 2007 together with Shaker she embarked on creating a book about the artist. Today, the first sample copy is ready, waiting for a publisher. Titled My Papers and Beyond, the book opens with a dedication to Vera Lagator and her portrait painted in oil by Ihab Shaker. My Papers and Beyond lists Shaker’s creative journey with text and abundant illustrations of his work, adding background on Egypt’s art surrounding the creative minds of the time. In it, we find hundreds of scenography works, costume designs – those realised and those presented only as sketches – interiors and studio designs for on on-air programmes such as Salon de la Femme / American Express for the Cairo Sheraton Hotel (1988), Windows Display for commercial areas, graphic art with film posters designs (for Youssef Chahine’s L’Autre, Le Destin and Alexandria… Why? and Hany Lasheen’s Al-Aragoz starring Omar Sharif), posters for artistic troupes, creative symposia, many festivals and special events held by the Ministry of Culture and Bibliotheca Alexandrina, drawings for press that include artwork and front covers of Sabah El Kheir magazine, alongside dozens of periodical and book covers. Away from his creative work, Shaker was also a dedicated academic and a beloved professor, mentor and father to all his students, and a supervisor of hundreds of research papers including MA and PhD theses. “Every time Nagy Shaker entered the faculty, we could feel his amazing vibes; everyone around him was inspired and happy. He was a great professor, giving a completely different dynamic to the time spent with the students,” Yehia recalls, referring to Shaker as her greatest mentor and second father, a brother and a friend – feelings shared by all his students. She adds that Shaker would go to the extent of buying books for the students, photocopying articles from magazines, searching for additional material online, supervising their work not only on the academic and official but also often the personal level, always doing much more than is required of a professor. On the other hand he listened to their worries, encouraged their dreams and gently directed their lives and careers. “We were all his children whom he embraced with love and wisdom, regardless of generation,” Yehia comments pointing to Shaker’s last minutes when his research for a material for one of his students was interrupted by a coma. 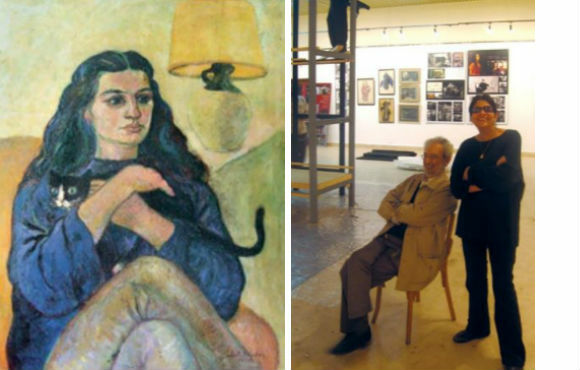 Yehia sums up Shaker saying that he was “an extraordinary academic, artist, human,” while Lagator immediately adds “and my love.” As both ladies sit on a couch reminiscing about the artist, Yehia underlines the love with which he showered his wife. “Whenever I called Shaker to ask after him, he would reply with a few short words and then immediately talk about Vera,” she says, smiling. It becomes obvious how Vera and Nagy created an image of beautiful contrasts, with Vera’s extrovert dynamism and Nagy’s internalised passions, thoughts and ideas materialising in art. “He was loved by everyone. This was so obvious. A huge crowd of people of all ages, his students and colleagues, who came to his funeral at church to pay their final respect,” Lagator comments. Until the last weeks of his life, Shaker had ideas for new projects and thought about them even in the most unusual – not to say, challenging – situations, when in an ambulance on his way to the hospital or having just finished his MRI tests. Shortly after Shaker’s passing, the Faculty of Fine Arts organised a gathering that saw large crowds of his students and colleagues. He was also honoured during the 25th Cairo International Festival for Contemporary and Experimental Theatre, which closes on 21 September. He will be remembered in the international scene that opened doors to him and honoured him with many awards. At the same time, it is not enough to say that Nagy Shaker enriched Egypt’s arts scene and scores of students with many values. He actually repositioned the country’s creative landscape and its image on the international arena. For this he deserves to receive a stronger light inside Egypt, the young generations should be taught and reminded of the creative riches that Shaker – and very few of his equals – brought to them. Shaker’s passion, skill, knowledge, patience, determination, unconditional support and warm smile are forever engraved in the minds of those with whom he interacted. His art remains in the cultural consciousness of millions while Rihana’s beautiful face will keep reminding us of the wealth that her father gave us generously.